Some background. The opening speaker at the “Oil-by-Rail: What’s Next” meeting in Albany on October 24th was a citizen from the small village of Lac Mégantic, Canada. Marilaine Savard, community leader from Lac-Mégantic--Quebec’s Citizens Committee--shared that community’s journey since the July 6, 2013 rail disaster. Marilaine showed the above video taken by a friend to a group of concerned groups from around New York State. Her friend Adrien Aubert, risking life and limb, started taping this video from his cell phone immediately after the explosion—but it has only been recently released online. It’s raw and brutal, which can be felt regardless of what language you speak and seen when Adrien turns the camera on himself near the end of this powerful video. But this description doesn’t quite cover the emotional toll which has taken this small village almost two years to begin their recovery. Now folks in Lac-Mégantic are starting to reach out to the world to help them find an economic recovery for their town that doesn’t rely on sending volatile crude oil through their beloved town and risking their lives many times each day. Our friends from Lac-Mégantic also want communities like Rochester to understand that we are subject to the same kind of threat as they were. 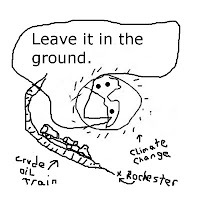 Senator Schumer has been trying to improve the safety of trains hauling crude oil for some time. Local firefighters are training for crude oil railcar accidents, though there’s no way to prepare for the kind of spectacular explosions when several ‘Bomb Train’ railcars blow up at once. Most of the folks who perished in Lac-Mégantic could not have been saved by any rescue team, no matter how well trained the first responders were, because the deaths occurred instantaneously from a fireball that rose hundreds of feet into the air. Fairport, New York Tuesday - November 3, 2015 Explosive oil trains are traveling right through the heart of Rochester. They travel through town centers, busy retail areas and right over High Falls. The oil in these tanker cars is more explosive than regular crude because it is obtained through a fracking process from the Bakken Shale formation in North Dakota. This “Bakken” oil has much higher levels of suspended volatile natural gas liquids. There have been over 30 derailments and explosions in recent years, including one in Canada that resulted in 47 deaths and the destruction of a town. Each tanker car carries 30,000 gallons of Bakken crude, and according to the City newspaper, up to 300 of these tanker cars pass through Monroe County daily. The area within half a mile from the tracks in immediate danger from an explosion is considered the “Blast Zone,” and the evacuation zone is within a mile from the tracks. But the danger from toxic vapors that such an explosion would emit extends far beyond that. The tanker cars puncture at less than 20 mph. If even one tanker car explodes, it will require a multiagency disaster response for Monroe County. 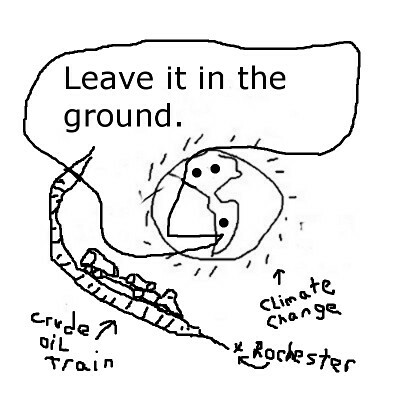 The public is urged to learn more and sign the petition at www.mothersoutfront.org/stop_oil_trains. Local “Mothers Out Front” members and allies will be demonstrating in Fairport where the railroad tracks cross North Main Street. So many people are simply unaware of the danger these “bomb” trains pose to the town and its citizens. The demonstration will occur on Tuesday November 3, 2015 from 4:00 PM to 5:30 PM.